Rheumatoid arthritis patients who take a twice-daily 10 mg dose of Xeljanz may face an increased risk for blood clots in their lungs, as well as death. Moreover, the FDA has never approved the twice-daily 10 mg dose of tofacitinib to treat RA, as this regimen is only indicated for use in patients with ulcerative collitis. Rheumatoid arthritis, also known as RA, is a progressive, chronic condition in which the body’s immune system attacks its own tissues, specifically a thin membrane around the joints called the synovium. This results in inflammation, stiffness, and swelling in the joints. For most people, the swelling, stiffness and joint damage associated with RA will worsen over time. Xeljanz is a janus kinase (JAK) inhibitor. JAKs are enzymes that work within the immune system and other cells to transmit signals that influence their function. By inhibiting JAK in immune cells, the drug interferes with the processes that cause RA. While other RA treatments are administered via injection or infusion, Xeljanz is available in tablet form. 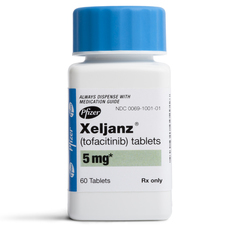 The U.S. Food & Drug Administration (FDA) approved the 5 mg dose of Xeljanz (tofactinib) in November 2012 to treat adults with moderately to severely active RA and who can’t take methotrexate. In February 2016, Pfizer announced the approval of Xeljanz XR, an extended-release 11 mg tablets for the once-daily treatment of moderate to RA in patients who have had an inadequate response or intolerance to methotrexate. Finally, the agency cleared tofacitinib for the treatment of ulcerative colitis in May 2018. Because it impacts the immune system, Xeljanz increases the risk that patients will develop serious, opportunistic infections, including tuberculosis. Consequently, people with an active infection should not take tofacitinib, while those who develop symptoms of an infection while using the drug should contact their doctors immediately. A Black Box Warning on the Xeljanz label recommends that patients receive a tuberculosis test before starting treatment. The warning further notes that bacterial, fungal, viral, and other opportunistic infections leading to hospitalization and death have occurred in patients using tofacitinib. In some cases, patients have developed lymphoma and other malignancies. Allergic reactions. Xeljanz patients should seek emergency help if the experience hives; difficulty breathing; or swelling of the face, lips, tongue, or throat. Xeljanz can interact with a wide range of prescription, over-the-counter, and herbal medications. Therefore, patients should inform their doctors of any other drugs they are taking before beginning treatment with tofactinib. Patients should not use this medication if they suffer from severe liver disease. Additionally, they should not receive a “live” vaccination during treatment, and they should avoid contact with anyone who has. Tofactinib is a pregnancy category C drug. While there have been no well-controlled studies to assess its effects on a pregnancy, animal studies suggest that Xeljanz may cause birth defects in a developing fetus. There ore, it should only be used in pregnant women when the potential benefits justify the risk. It’s unknown whether Xeljanz is excreted into breast milk. For that reason, nursing mothers should either stop taking the medication or discontinue nursing during treatment. When the FDA initially approved tofactinib, it required Pfizer to conduct a clinical trial to asses the risk of heart-related events, cancer, and opportunistic infections at two doses (10 mg twice daily and 5 mg twice daily) in combination with methotrexate. The study compared the rate of these adverse events among patients taking either Xeljanz or a tumor necrosis factor (TNF) inhibitors to treat RA. The FDA required that RA patients enrolled in the study be at least 50 years old and have at least one cardiovascular risk factor. Apparently, that trial is ongoing and is expected to be completed by the end of the 2019. In the meantime, the FDA is working with Pfizer to evaluate other currently available safety information for tofacitinib and will update the public with any new information based this ongoing review.